I’m happy to say that everyone was very excited to talk about what they enjoy pairing with their favorite red wine! I have a feeling the conversation will come up again on the night of the Three Blind Wines event on October 16 at The Powerhouse. I’m including all of the responses below in case you have some red wine at the house and are in need of a couple of ideas. The winner of the EatingOxford.com/Three Blind Wines contest is… Caitlin Loder! More than 30 EatingOxford.com readers responded to win a VIP Team package to the event, which includes admission for two and three bottles of Matchbook wine from Crew Wines for contest entry at the event. Thank you to all those who participated! If you didn’t win this time, I hope to still run into you at the event. Tickets are available here. Are you ready to win a VIP Team package ($100 value) to the 3rd Annual Three Blind Wines event happening on Tuesday, October 16, from 7:00 p.m. to 9:00 p.m. at The Powerhouse? The package includes admission for two, plus a wine expert will choose three bottles of wine for your team. All you have to do is show up! As an official sponsor of the Three Blind Wines event, EatingOxford.com has been authorized to give away one of these VIP Team Packages, and entering is easy! Simply answer the following question: What is your favorite food to pair with red wine? A winner will be chosen at random on Wednesday, October 10, from all entries submitted to liz@eatingoxford.com (please include your answer, full name and phone number). Three Blind Wines is an annual wine tasting event presented by the Yoknapatawpha Arts Council and the Lafayette Oxford Foundation for Tomorrow. It is a wine tasting with a twist! 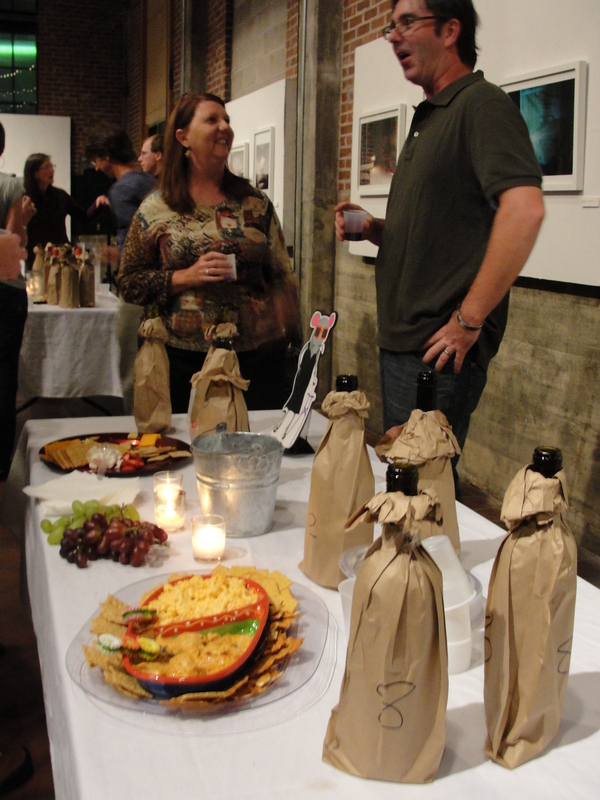 The Yoknapatawpha Arts Council and LOFT (Lafayette Oxford Foundation for Tomorrow) have created a blind wine tasting where teams compete – placing their favorite red wine up against other team’s favorite wines. Teams of two people select three bottles of the same red wine to represent their team at the event. Two of every team’s bottles of wine are set out for the tasting with the labels covered and the third bottle of wine is reserved as part of the prize for the winner. Teams can be comprised of any two people. Bring your spouse, best friend, or plan a ladies night out! Everyone then samples all the wines, voting for their favorite wine of the night. The team that receives the most votes wins all the other team’s third bottle. Winners could go home with a cellar full of free wine! I’m looking for two people to team up with EatingOxford.com for the upcoming Three Blind Wines event on Tuesday, November 15 from 7:00 p.m. to 9:00 p.m. at The Powerhouse. EatingOxford.com is being sponsored by two wine companies for the event. I can’t drink all of that wine and eat all those finger foods by myself, so who out there wants to come and help me—for free? You heard right; if you’re on one of my two teams, you attend free! One of our team wines will be Silver Peak Pinot Noir from California. It boasts complex fruit aromas and delicate cherry and raspberry flavors, pairing well with roasts, chicken, and grilled or baked salmon. Our second team wine is an oak-aged wine from Chile—Chilensis Reserva Cabernet Sauvignon—featuring notes of blackberries, blueberries, cherries, plums, vanilla, coffee and leather along with herbaceous notes of black pepper and bay leaf, which pair well with red meat, pate, lamb and game meats. Interested in being an EatingOxford.com teammate? Email Liz at foodie@eatingoxford.com with your full name and phone number along with a short paragraph stating why you think you’d be a great addition to my team. The deadline for entries is Thursday, November 10. To recap how the event works, Three Blind Wines is a collaboration between the Oxford Tasting Society and the Yoknapatawpha Arts Council. The event is a blind wine tasting where you and a teammate select three bottles of the same wine. Two of the three bottles of wine are set out for the tasting with the labels covered up, while the third bottle is held as part of the wine auction prize. Everyone then samples the other team’s wines and votes for their favorite wine of the night. The team whose wine is selected as the most popular of the night wins the auction, which includes all the other team’s third bottle of wine. Winners could go home with a cellar of free wine! Tickets to the event are $25 per team ($20 for members of the Arts Council and Oxford Tasting Society) plus the cost of three bottles of red wine. The proceeds benefit YAC and Oxford Tasting Society and annual programs presented by the organizations. Tickets are on sale at the Powerhouse Community Arts Center. Ticket buyers who present their tickets at Star Package Store and Kiamie’s will receive a discount. 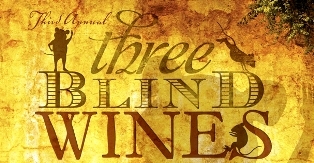 For more information about 3 Blind Wines visit http://www.oxfordarts.com or call the arts council at 662‐236‐6429. UPDATE 11/12/11: Congratulations to Shanna Flaschka and Robert King! They’ll both be teaming up with EatingOxford.com this coming Tuesday, November 15, at 3 Blind Wines. 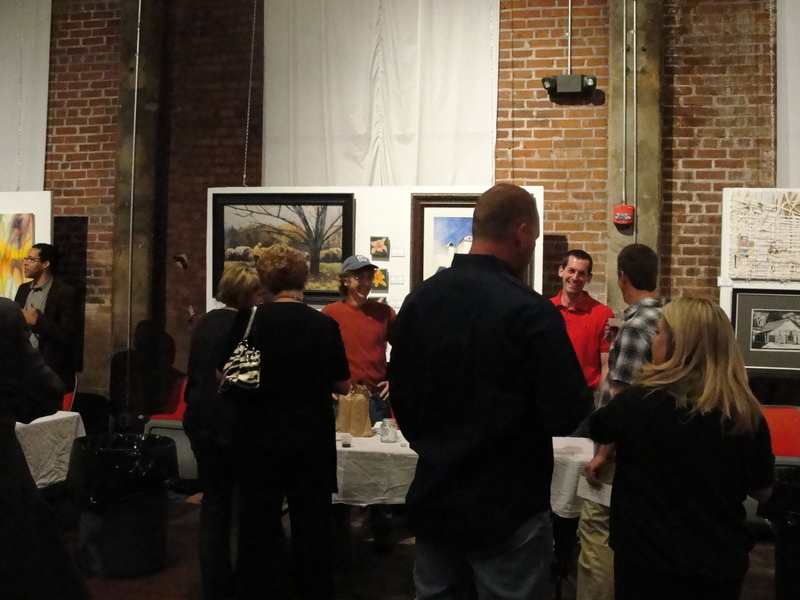 UPDATE 11/17/11: As always, the 3 Blind Wines event was a blast! 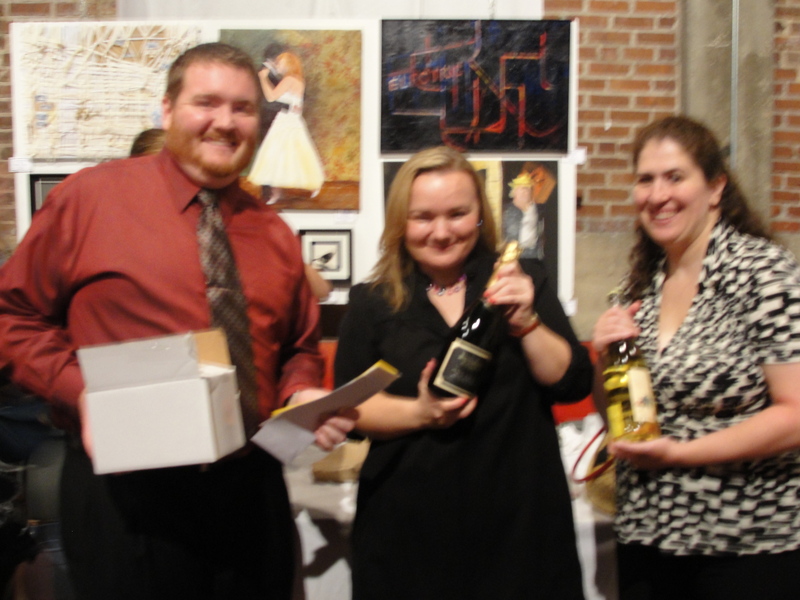 And while we didn’t walk away with the grand prize, my teammates and I won a ton of raffle prizes! One of our wines—Chilensis Reserva Cabernet Sauvignon came in 3rd place! OK, if you like wine, this is the event for you! 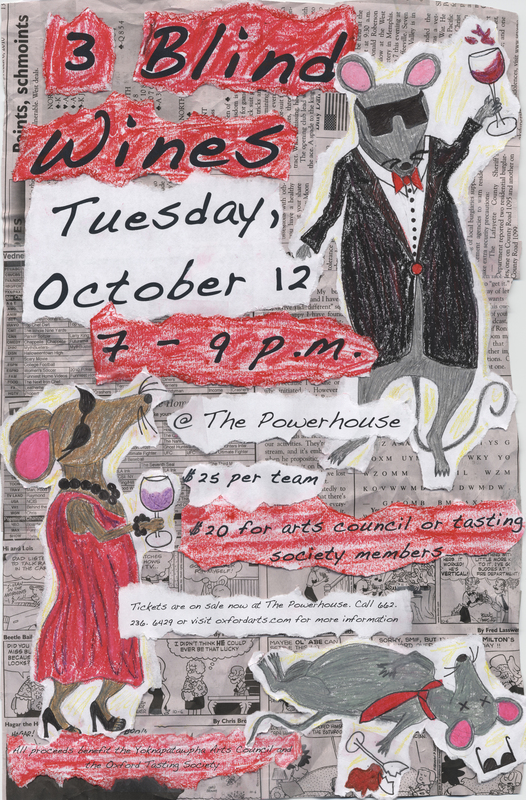 This coming Tuesday from 7:00 p.m. to 9:00 p.m. at the Powerhouse, the Yoknapatawpha Arts Council and the Oxford Tasting Society are holding 3 Blind Wines, an event that invites teams of two people to select three bottles of the same wine and enter two of them in a tasting to win over the crowd—and a whole lot of wine! If your team’s wine is chosen as the favorite, you win one bottle each of ALL of the wines brought to the event! And what’s wine without a bit of cheese to cleanse the palate, right? 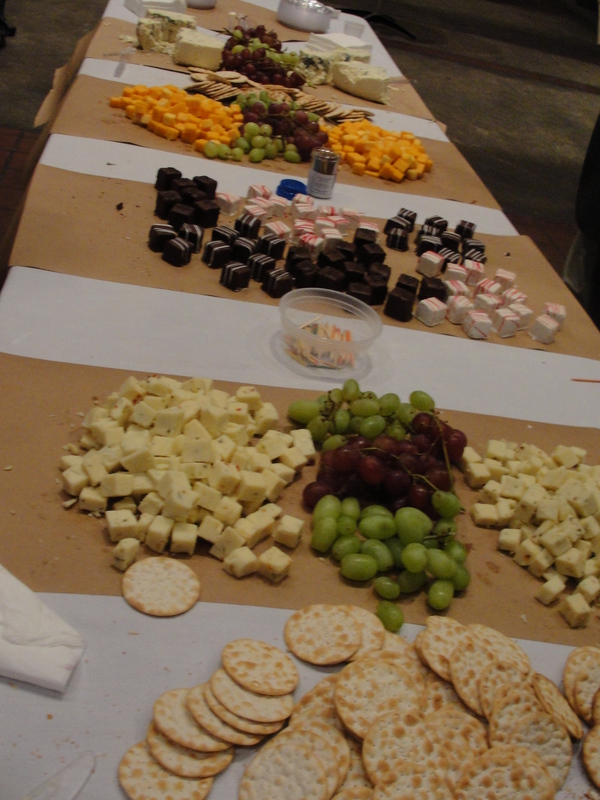 YAC PR intern Catherine Cartwright divulged that there would be cheese and other nibbles on hand for those needing a break between tastings. Wines can be purchased from PJ’s, Kiame’s or Star Package, and event organizers will pick them up and have them waiting for you on Tuesday. Tickets are on sale at the Powerhouse for $25 per team or $20 for Arts Council/Tasting Society members. Official rules and wine order forms will be given at time of ticket purchase. All proceeds benefit the Arts Council and the Oxford Tasting Society. UPDATE 10/14: What a fun event! If you didn’t make it out for this one, don’t miss the next. Lots of great wines to taste and the perfect way to pick out some new favorites. My team’s wine was only one vote away from winning!